If you could list with one hand the most essential forklift components, what would they be? 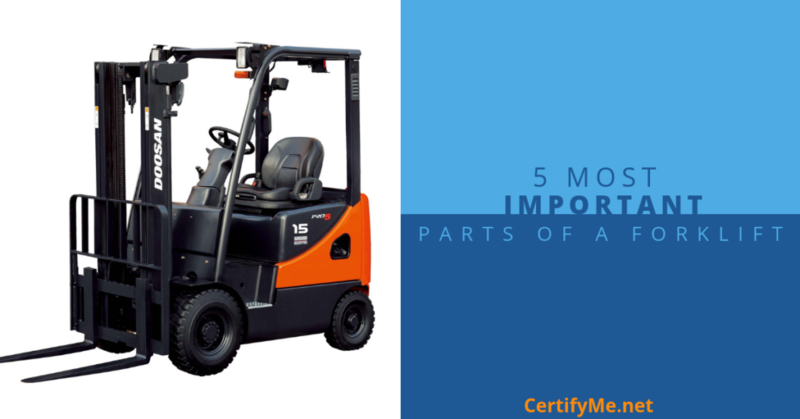 Every part of a forklift is “important” in some way, but which ones really stand out? Certain forklift parts and functions are designed to maintain the safety of the equipment and to help prevent malfunctions that can lead to severe accidents. With forklift education from CertifyMe.net, your company will learn all they need to know about the parts of a forklift, safe work practices, OSHA guidelines, and much more. If you’re unsure about your current compliance situation, don’t hesitate to sign up today. It’s an excellent investment for your company, and more importantly, workplace safety! If you have bald, cracked or overly-worn tires, you’re merely inviting disaster. Driving on tires that need to be replaced can make your forklift unstable. Without proper tire care, you can be in danger of slipping out and can even affect the load you are moving. Since Forklifts are made without suspension, your tires act as your only cushion between you and the ground. Forklift tires should be able to support nearly 10,000 pounds, so they need to be up to the challenge! In addition to cracking, look for distress over the wear line. When your tires are worn out past the wear line, it’s time to replace them. Other signs you need to replace your tires are chunks of tire falling off, tearing, and flat spots. As one of the most critical parts of a forklift, your tires must be strong and sturdy. – Pneumatic. These tires are usually used as essential forklift components for outdoor environments. Rough terrain lifts and other heavy-duty applications use pneumatic tires. – Polyurethane. For superior traction, exceptional durability and great strength-to-weight-ratio, polyurethane forklift tires fit the bill. They’re common forklift components for indoor and electric forklifts and pallet jacks. – Solid rubber. Instead of air, this type of forklift component is solid rubber. One of the most popular and widely used types of forklift tires, they’re used both indoors and outdoors. Turn signals, lights, the horn and more – taken together as a single part, it’s hard to argue their importance. The warning indicators are essential forklift components to help prevent accidents, which is a crucial component of understanding forklift parts and functions. Standard colors include yellow, red, blue, and white. Many of today’s high-tech forklifts use LED warning lights for better visibility in all types of conditions. Warehouses are busy, bustling spaces that are full of activity and sounds. Without adequately functioning warning signals, forklift operators and on-foot workers may not have the level of awareness they need to avoid each other and prevent accidents. The pre-start inspection all forklift operators must perform before each shift can indicate any of these warning indicators that need to be tuned up or replaced. The forks are the parts of a forklift for which it’s named and is the two pieces that are located at the front of the forklift, near the tires, and extend outwards to lift and carry loads. The forks are crucial to the safe operation of a forklift. Damaged or faulty forks, like tires, can lead to catastrophic consequences when you’re trying to handle heavy loads; ignore them at your own peril! Even though forks are made of metal, they can suffer damage from misuse or accidents. When forks are cracked, bent, or otherwise damaged, they affect not only the forklift’s ability to handle a load but also the safety of the operator and workers nearby. Unstable amounts due to malfunctioning forks can cause loads to fall over, crushing workers, causing obstructions, and damage to the worksite. Malfunctioning controls could mean the difference between a safe day on the job and an OSHA investigation. The controls in the cockpit are what allow the operator to control the machine, divert a dangerous situation, and keep the forklift out of harm’s way. If these parts of a forklift aren’t functioning correctly, or an untrained worker is controlling them, hazardous situations can arise. The operator driving the forklift may not be able to avoid hazards, and workers on-foot may be put at risk if operators aren’t able to control the forklift and avoid coming into contact with the pedestrian zone. The cockpit controls keep everyone safe in a worksite and are one of the most important parts of a forklift. Now onto the most important forklift “equipment.” Thought we’d go with another electrical or mechanical component, didn’t you? By far the most important part of a forklift is the operator. “Give me a great driver with an average forklift over an average driver with a great forklift any day of the week,” said one warehouse manager. And we agree with him. Forklift accidents happen every year in warehouses and on worksites, and the most common cause of these accidents is operator error due to lack of proper forklift component training. This means that the improper use of a forklift by the operator is what caused the majority of annual injuries, fatalities, and equipment damage. Learn how to operate the machine properly and understand all the different parts of a forklift through the best forklift certification training. Through training, workers should learn how to operate all the different types of forklifts in their workplace, how to perform inspections of the equipment and the environment, and how to avoid hazards. Training must include all these most important parts of a forklift, including how to check the fluid levels, inspect the forklift before and after shifts, and make sure nothing puts workers in harm’s way. No single forklift part (besides the driver, of course) is as important as safety training. But not just any forklift instruction; you want an affordable, efficient, everlasting training. That’s why CertifyMe.net is the smart choice. Our training modules cost hundreds (if not thousands) less than so-called safety “experts.” They cover all the concepts you need to become a better, safer forklift operator. And once you sign up, we’re with you the rest of the way. Lifetime support. Free, easy renewals. And much more. In addition to teaching how to operate a forklift, we also teach you how to perform equipment inspections and maintenance for all the parts of a forklift, how to assess the surrounding environment for hazards, how to recognize and avoid hazards, and all OSHA regulations. Workers that complete our training are the most efficient, productive, and compliant with industry standards. This is good not only for preventing accidents and creating a safer workplace but also for business and your bottom line! – Instantly printable operator certifications! And the best part is, you don’t need to travel to an offsite facility and pay for costly classroom training. Get your workers trained and certified in-house, with your own Trainers through our Train the Trainer course. You can save hours of time, thousands of dollars in training costs, and maintain the productivity of your workplace. Ready to experience the difference with Certify Me? Give our OSHA forklift specialists a call at (888) 699-4800, and we can discuss your company’s specific requirements. Click here to get started today. Our affordable and accessible OSHA compliant training courses are ideal for any company. We also provide lifetime support and 3-year renewal training, too! CertifyMe.net meets and exceeds all of your OSHA compliance requirements – all in one convenient place! Get certified and become an expert in all of the most important parts of a forklift in one afternoon! Thanks for reading the CertifyMe blog!